Last year Spotlight reminded audiences of the importance of true journalism in an age where people seemed more concerned with popular opinion than facts. While Tom McCarthy’s film examined this through the dramatic framing of a scandal involving The Catholic Church, directors Austin Andrews and Andrew Holmes take a more comedic approach to their commentary on the modern state of the newspaper industry. Their film Lord Jones is Dead takes several jabs at the sensational nature of news reporting while also lamenting the declining state of the industry as a whole. 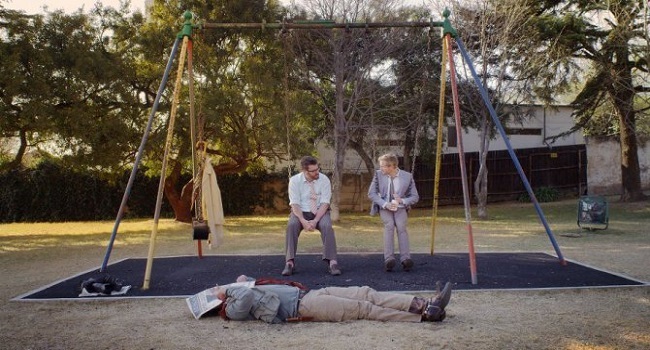 Set in Johannesburg, the film focuses on two journalists, Samuel (Chad Krowchuk) and Vincent (Daniel Janks), from rival newspapers and a photographer, Clive (Jonathan Pienaar), as they stakeout a house for a possible story. Given very little information regarding their latest assignments, the men simply know that the woman who resides at the home may or may not be having an affair with a government minister. As each have been instructed not to not leave their post until there is a story to report, and unsure of what the woman even looks like, the men try to keep their sanity by reading the paper, playing word games, and discussing the demands and hurdles of their various publications. Considering its dialogue driven narrative and fast-paced delivery, it does not come as a surprise that Lord Jones is Dead is an adaptation of a play by Matthew Clayfield. There are times, take some of the characters’ personal plights and jealousies for example, when the film feels like it is reaching to find discussion topics to pad its feature length running time. After a while the recurring “Is that her?” gag, which Andrews and Holmes frequently uses as a palette cleanser to transition into new points of conversation, starts to feel tired. Furthermore, some of the tangents, including the amusing if somewhat out of place musical number, do not resonate as they should. Despite these missteps, Andrews and Holmes’ Lord Jones is Dead works best when it turns its scathing comedic tongue towards the journalism industry on the whole. The film feels most alive when it touches on issues such as the ways in which declining sales are leading to more and more layoffs, society’s obsession with stories of crime and violence, and how apathy and the internet have impacted print journalism. Credit for this must not only go to Clayfield’s gift for writing snappy banter, which is really quite funny, but to the three leads as well. Krowchuk, Janks, and Pienaar are quite good in the film and are always mindful to ensure that their characters never fall into the realm of farce. Lord Jones is Dead may not consistently hit the same heights of the classic journalism comedies that it is clearly inspired by, but there are still plenty of laughs to be found in the film. If the plot had been fleshed out further, then it would truly be a film to stop the presses for.